I truly enjoyed this month's Scripture Challenge at K-Joi Studios. 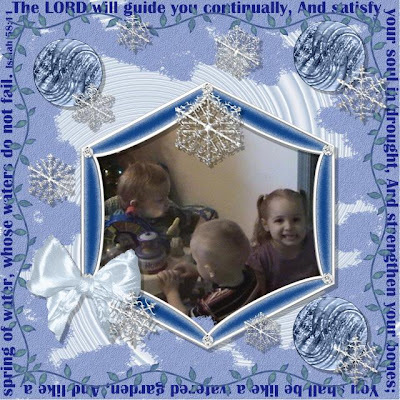 The verse we worked with is awesome, and I always love including photos of my grandchildren in my layouts. I changed the quickpage color from green to blue and then embellished it with wintry items in icy blue colors. If you'd like to join in on this challenge, you'll find the link below in my data. This is a beautiful LO, but sorry, I don't recognize the kit as one of my own. Check your files again, so you can credit the artist who created it - it really is a work of art!